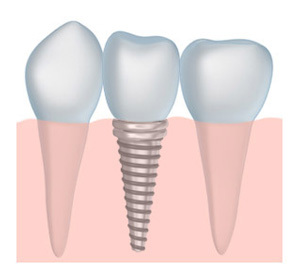 Dental implants represent one of the most incredible advancements in dental technology. A dental implant is a synthetic post (often composed of a titanium alloy) which is used to replace the root of a natural tooth. The dental implant undergoes a process called “osseointegration” (bone fusion) in which the implant actually fuses with the jawbone and supportive tissue. This new dental implant acts as a long-lived and extremely strong foundation on which a new dental crown or other dental prosthetic may be placed. You are left with a great smile to serve you well for the rest of your life. If you suffer from uncomfortable dentures, or are embarrassed by missing teeth, dental implants may be just what you need. Thanks to the latest cosmetic dental technology, dental implants look and feel like natural teeth. They are a permanent solution to the problems caused by tooth loss. The tooth restorations placed on dental implants are made of innovative materials which can be matched to blend in with your other teeth and even reflect light the same way as natural tooth enamel. The implant dentistry process often takes only one or two visits and can last for many, many years. The result is a comfortable, long-lasting solution to the discomfort and embarrassment of tooth loss. One of the best benefits of dental implants is their ability to slow or stop the bone loss in the jaw associated with missing teeth. This helps our patients avoid the “sag and bag” experienced by those who wear traditional dentures or who are missing several teeth. Call the Manheim dental implant office of White Family Dental today to find out if dental implants are right for you.